Klockownia is the exceptional play & learn place for kids that combines advantages of a joyful indoor playground and the education center. It is a space specially designed for developing social competences and collaboration, creative spatial thinking, logic, imagination, concentration or small and large motor skills. 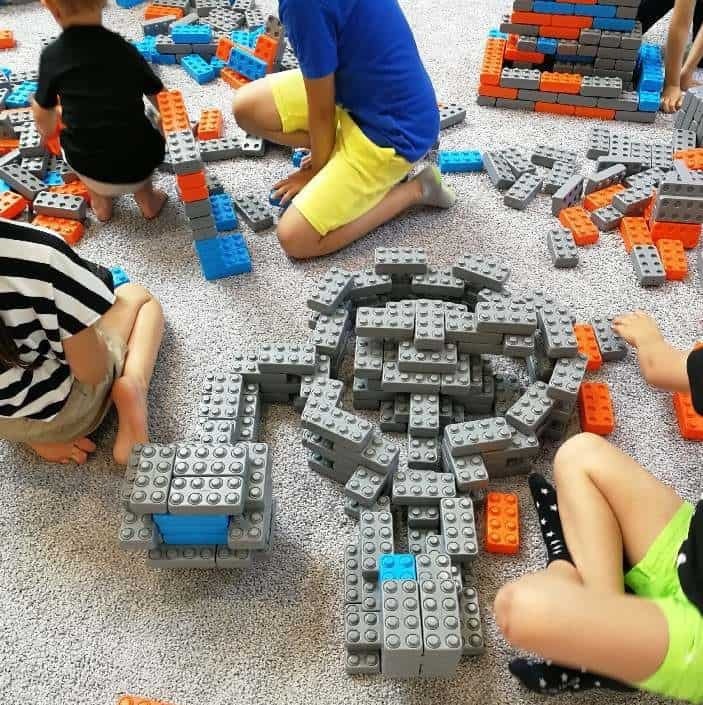 Playing with blocks, kids experience their first own successes and achievements, they can discover, make mistakes while unconsciously and constantly learning. 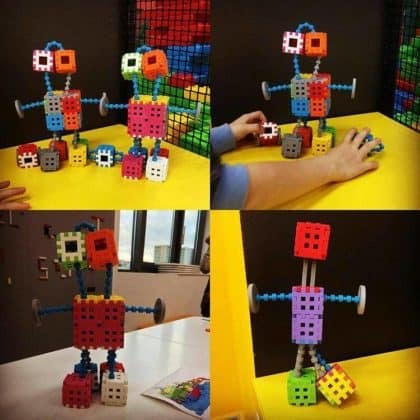 Such fun is an easy and safe way to help children build their self-confidence and maintain their curiosity. 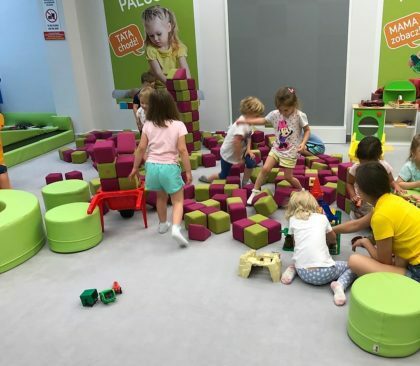 ‘Little Fingers Area’: the area dedicated to the youngest guests (children from 9 months to 5 years old). 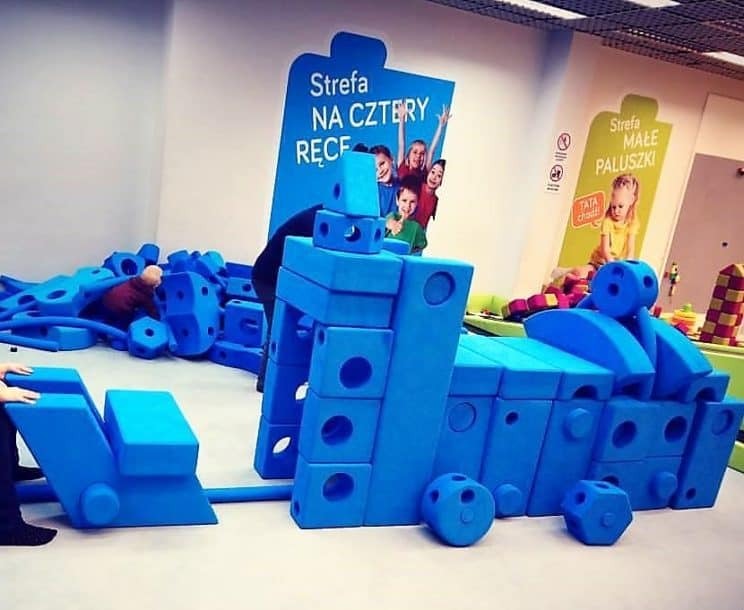 You will find there large, soft, plastic, and magnetic blocks – just right for a toddler who begins his/her adventure with playing. This zone supports the development of learning about the first shapes, colors, relationships between them, concepts like inside and outside, open and closed, near and far, searching for similarities and pointing out differences. For such small children, playing with blocks expands productive thinking by activating their memory. 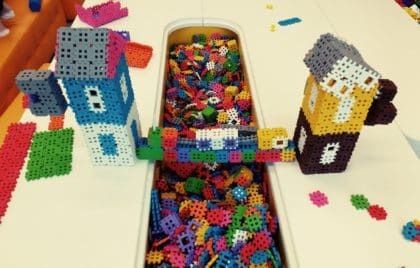 It also has a big impact on the development of speech because the child is trying to name what he/she has built. Playing with mum or dad also helps to strengthen deep emotional relation and self-confidence of a child. 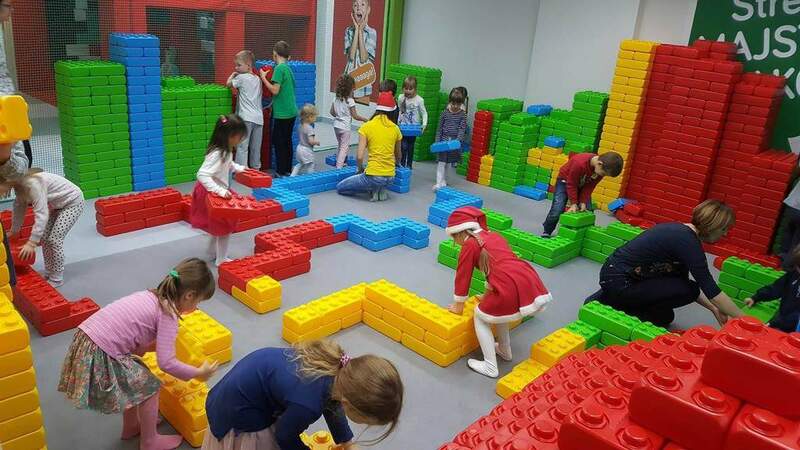 ‘4 Hands Needed’: the area dedicated to everyone who can manage to pick up, move, and stack large blocks. 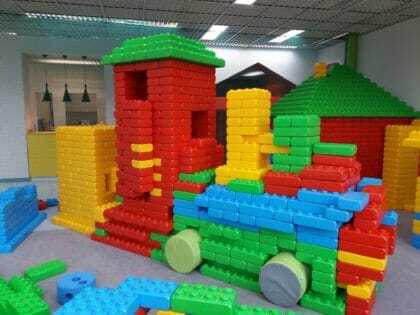 Playing with blocks shapes the child’s personality and supports its social skills. 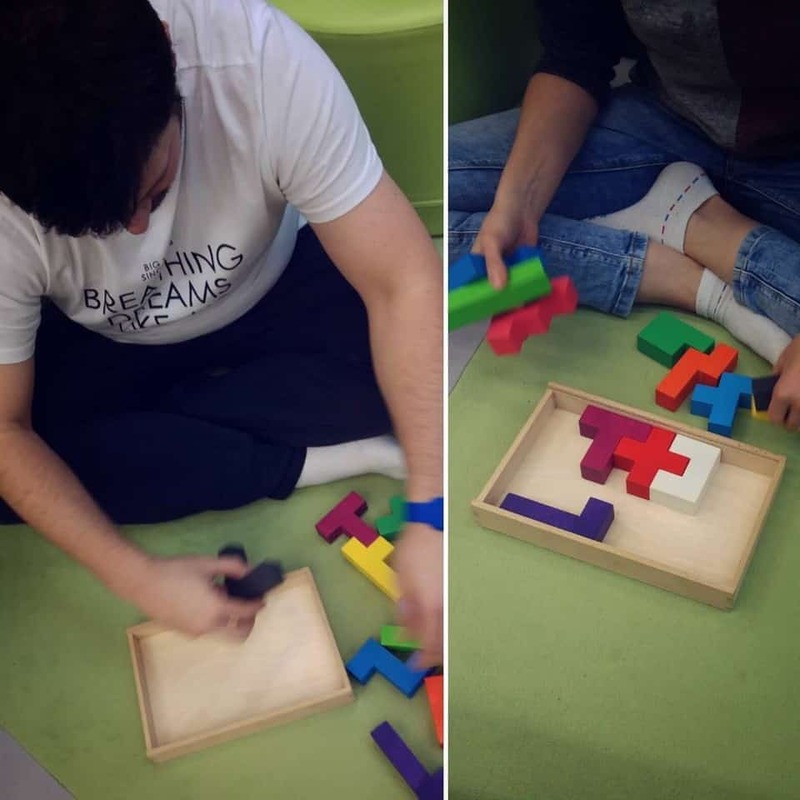 Especially large blocks – carrying and arranging them require the collaboration of two or more kids and encourage immediate exchange and communication. 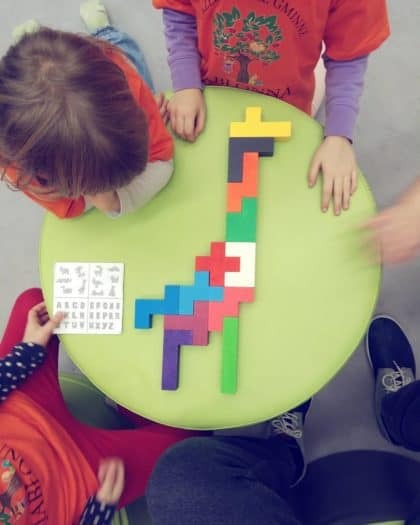 The sets of blocks in Klockownia are deliberately chosen in such a way that children are more willing to help each other. 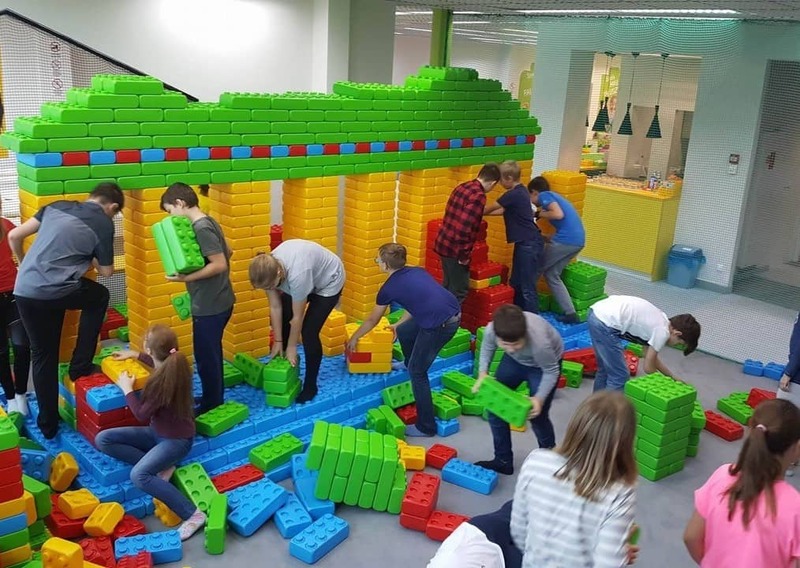 Social challenges, valuable collaboration lessons and group activities are built directly into the experience of playing with large blocks designed for kids 7+. 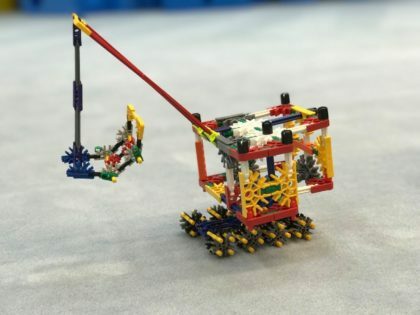 Kids can take the leadership roles, responsibility for their participation in the work and they make their independent decisions on solving conflicts and setting new goals on their own. ‘Hocki Klocki’: the area dedicated to children aged 3+. 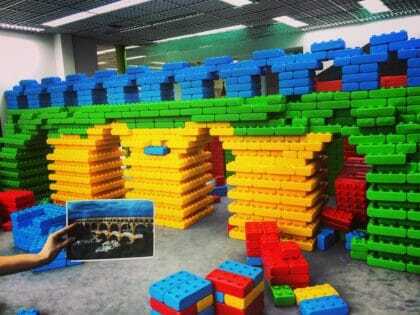 Younger children can play in the area exclusively under the constant supervision of parents. 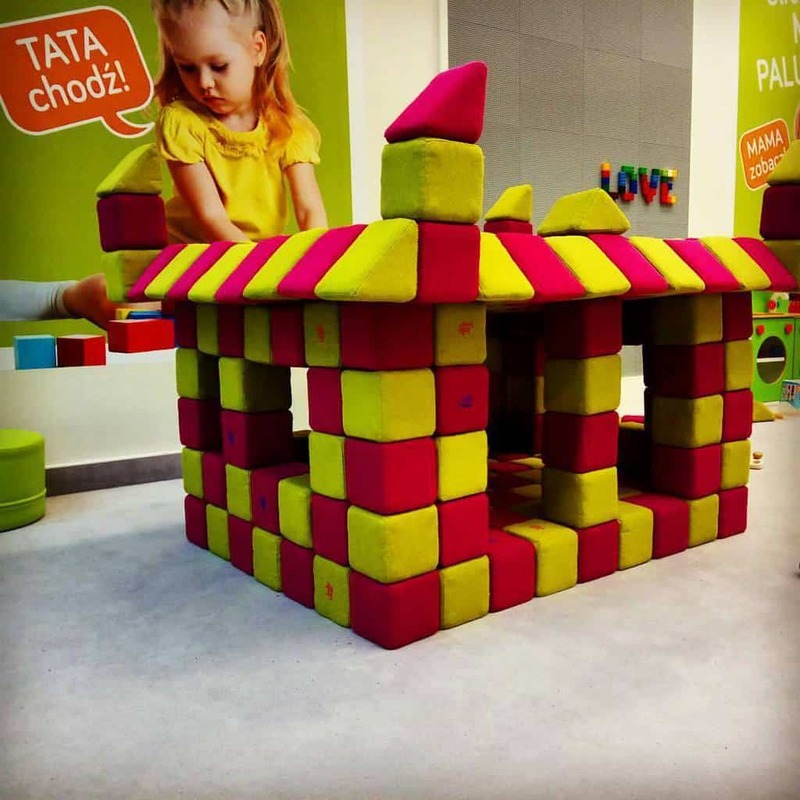 The multiplicity of shapes and infinite configuration possibilities make the blocks a tool for supporting the quick development of the intellect and maintaining the continuous mental activity. 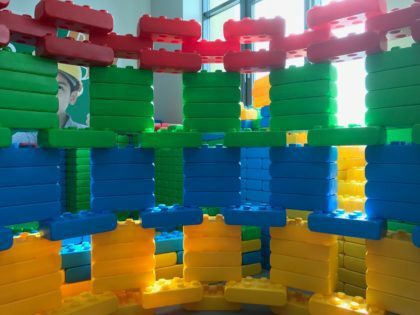 Without instructions, building with blocks develops imagination, creative thinking, planning, and implementing your own ideas by filling the space with fantastic constructions. 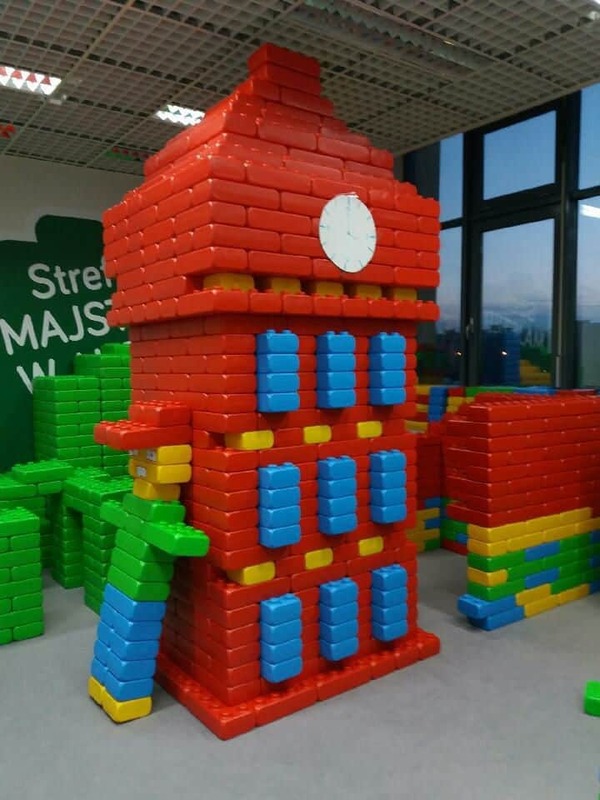 Thanks to that, the child turns his/her creative potential into playing, learning and understanding many areas of life in an easy and pleasant way. It is a very important element of learning how to combine new facts, reproduce and consolidate the acquired knowledge, shape the ability of analytical and synthetic thinking. 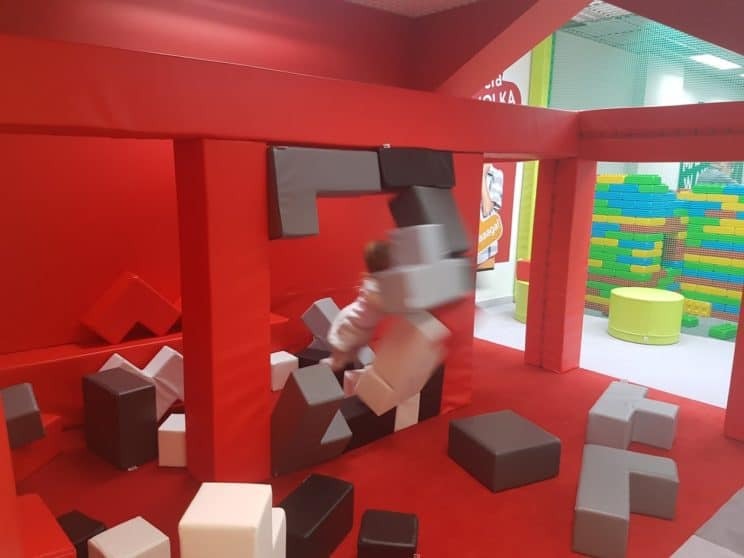 ‘Foreman in Action’: the area dedicated to everyone who can manage to pick up, move, and stack large blocks. Playing with blocks encourages kids to practice problem-solving skills, logic, and complex thinking. The building has a real impact on acquiring mathematical and physics knowledge: classification, scheduling, size, shape, counting, height, width, area calculation as well as results of forces activity. In the area of ​​large bricks, before a stable structure is created, the child’s imagination must have a picture, design, architecture, and plan of future execution. 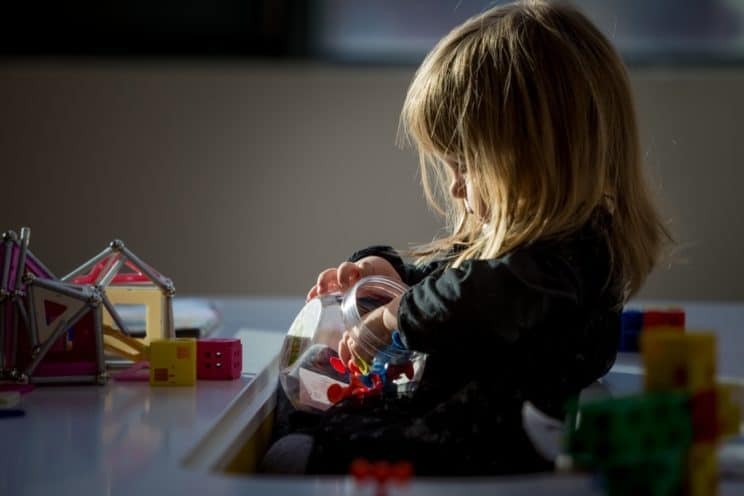 The work that children will do before the visible effect arises, is the unconscious effort of all areas of development: emotional, intellectual, social, and physical. 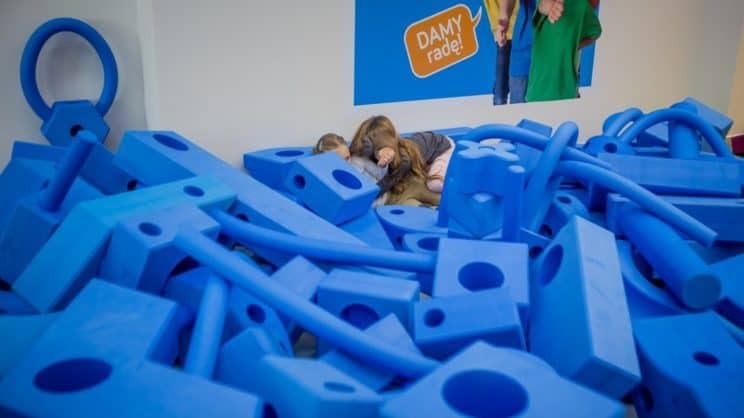 ‘Demolition’: the area dedicated to everyone who is spontaneous and likes fun. 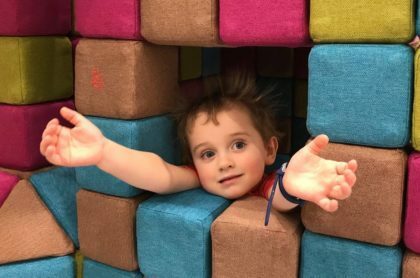 Big blocks from the ‘Foreman in Action’ or ‘4 Hands Needed’ zones require full body movements, which helps to develop motor skills and muscle strength. Demolition is the culmination of all the effort: the joy of demolishing, turning everything upside down, building from scratch. 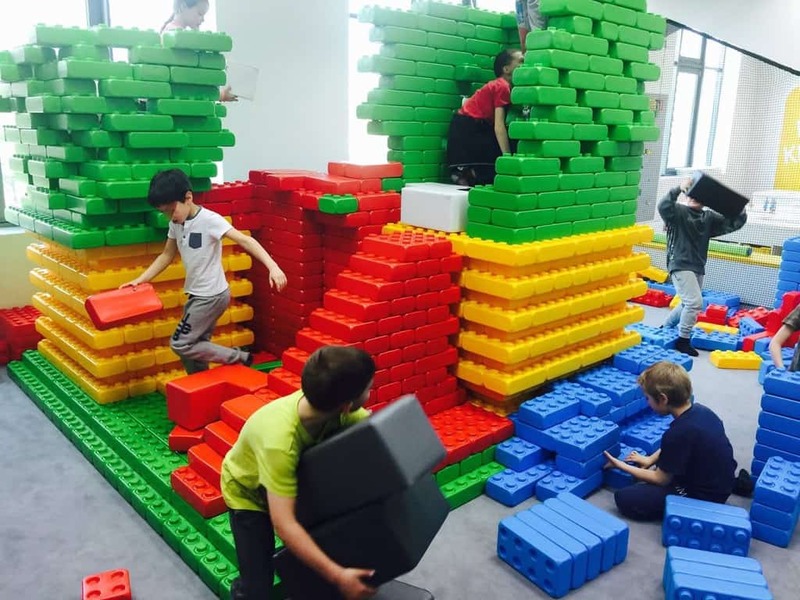 Playing in this zone is the expression of emotions, kid’s true face, stimulates action and teaches the kid the courage to start all over again and never give up. ‘Emotions Lab’: dedicated to kids aged 6-9. In the Emotions Lab, we experience playing the role, creating stagings, practicing different attitudes towards various experiences and most importantly – having fun together! 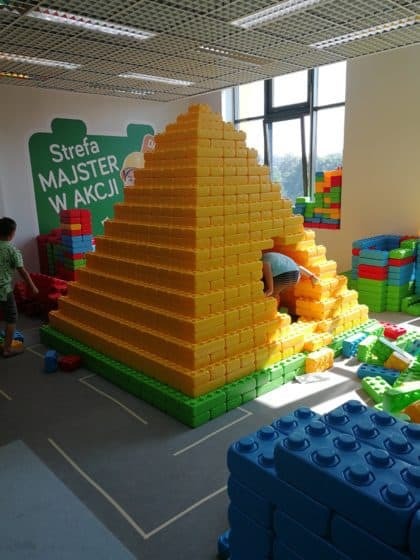 Stay tuned – soon another location in Warsaw – in Wilanów! 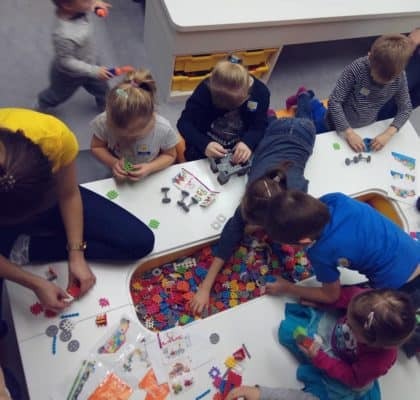 Click here to learn more about Play & Learn Birthday Parties with Klockownia organized in English or Polish. 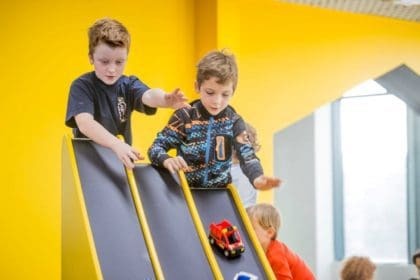 Your local friend and trusted guide to Warsaw and Poland for kids. 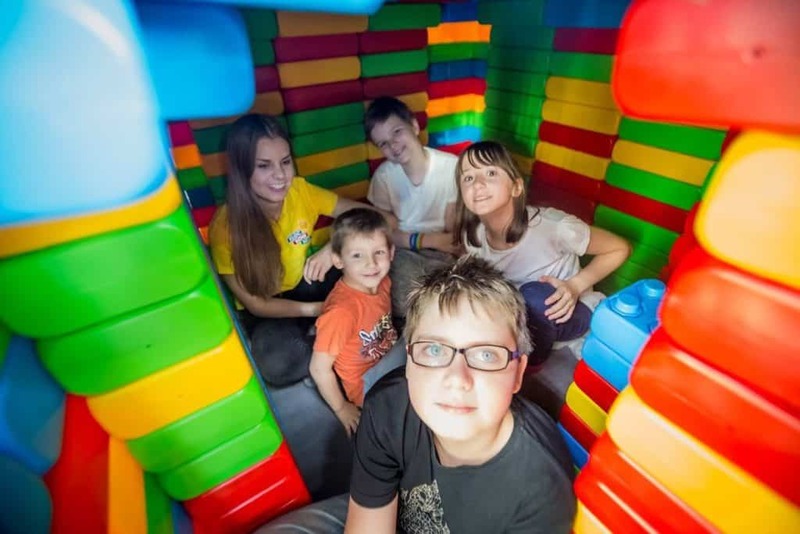 Our goal is to support families in their life in Warsaw and give you inspirations on how to spend time in Warsaw and Poland with kids.